Inexpensive coasters, such as plastic or cork backed varieties are great for giving away to customers alongside of other purchases. For example, a drinks retailer might like to include a free coaster with any purchase over £10. Getting something extra for free will make the customer feel appreciated so they will be more likely to want to come back. The promotional coaster will also work as a reminder of your brand when they are at home. Once they have finished the bottle of wine or whisky and thrown away the packaging, they will still have the coaster to jog their memory of the great service you provided. Plastic and cork backed coasters are ideal for these types of promotions, as they are cheap to produce and can be easily shaped and printed in all sorts of eye-catching styles. Yet they will feel like a quality product to your client, as they are solid and non-disposable. Give-away coasters will encourage people to come back to your business by making them feel appreciated, and continuing to remind them of your brand. Any business that organises events for clients can make use of coasters to re-enforce its brand at these occasions. For example, a business that is having a special promotional night could place branded coasters on every surface to remind customers of where they are and why they are there, each time they take a drink! Different coasters could contain different images and messages. A drinks retailer or bar might like to include slogans or images relating to the qualities it takes particular pride in - if it has a cosy atmosphere and stocks an especially good brand of local beer, these qualities could feature on different coasters. A type of coaster suited to this purpose would be an insert coaster. The actual coaster is made from clear plastic, whilst printed paper inserts display the brand logo and message. 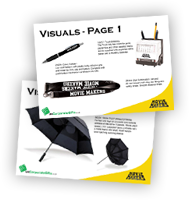 Full colour printing on these inserts will look eye-catching, and let you get across your message in a detailed, and vibrant way. Plus they can be used again and again at multiple events. Coasters at events will increase awareness and understanding of your brand identity. Cheaper branded coasters, such as foam coasters, can be used to promote short-term deals and offers in restaurant or pub. Whilst customers are ordering at the bar or eating their meal, opportunely situated coasters can be used to promote a particular deal that is currently running on a certain food or drink item. Or they could feature information about loyalty schemes - "Get a free roast dinner once you have five loyalty card stamps" for example. Coasters can even feature games, such as crosswords, to entertain customers whilst they are waiting for their order. Foam coasters are ideal for this type of up-selling, as they are very cheap, and can simply be replaced if they are spilled on, or when a particular deal or offer comes to an end. Coasters in pubs and restaurants are great for encouraging repeat and add-on purchases. More expensive crystal or glass coasters, or coaster sets, make thoughtful and much appreciated personal gifts to thank customers for their loyalty. For example, a bank whose clients have trusted them with their money for ten years, might like to remind those people why they decided to bank with them in the first place. A high-end, sophisticated gift like a glass coaster will tell customers not only that they are valued, but that their bank is generous towards and looks after its loyal customers. These clients will be more likely to continue to trust you, and give you their custom for many more years to come. Glass coasters can even be engraved with individual people's names, so that they are even more special. Elegant coasters given as personal gifts will maintain, and could even improve, customers' perception of your brand. 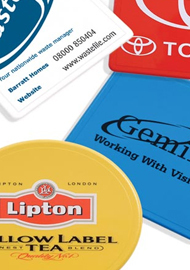 Coasters can be used in offices to instil a sense of brand identity and loyalty among employees. During coffee breaks, and in the staff room, employees will need somewhere to rest their glasses and mugs. Coasters will therefore get repeat daily views from everyone in your office. This offers the opportunity to subtly remind workers of their company and its values throughout the working day. These coasters could contain just the brand logo, or a slogan to further re-enforce your business's principles. Workers that have a strong sense of the company's vision and values will have clearer goals and objective, and thus be more productive. Coasters that have positive, friendly messages on them will also work to keep your employees motivated, reminding them of what a great place they are working in! Any type of coaster can serve this purpose, but a lenticular coaster with a fun, colourful image that changes when you tilt it, is guaranteed to catch employees' attention and keep morale high. These branded coasters will ensure that your workers remain focused and motivated, by keeping the business and its brand identity in their mind at all times. So now that you know the different uses that promotional coasters can have, and which varieties are best for these purposes, why not take a look a the wide range we offer on our website. Find all of the types of coaster mentioned above, and many more. 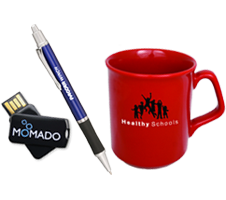 Have you ever wondered what the best promotional products are to use as giveaways? Wonder no more! This list is a compilation of some of the cost-effective and popular gifts that will help expose your business and gain you new customers. Engraved awards, paperweights and coasters make understated, elegant corporate gifts. Learn more about the engraving process and why it could be the perfect branding method for your business. Guinness were faced with the challenge of swaying new audience on a popular Halloween night. Read about their inspiration, details of their sales promotion and whether it paid off! See the process we went through to create these beautiful coasters for one of our clients. View the steps from artwork creation to finished product.